Legs feature a convenient "Thumb Release Button"
This Celina Tent fast shade pop up tent is ideal for on-the-go events like trade shows and tailgating parties. When collapsed it will easily fit into the trunk of most vehicles, and setting it up takes just a few moments. Features include a sturdy 40mm aluminum frame with 1" by 1/2" trusses and legs that are equipped with a special "thumb release" button to allow for height adjustment and no-fuss set-up and take down. The top consists of a 500 Denier polyester that will provide 100% UV protection, is water resistant, and meets flame retardency standards. A stake a rope kit are also included. 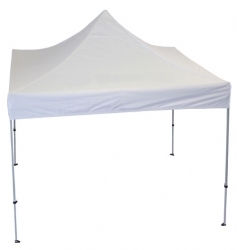 * Please Note: To protect the tent top and prevent pin holes and abrasions, it is recommended to use a drop cloth during both installation and striking of this tent.� Please find video links above for more information.